The group was founded by Keith Elam in Boston, Massachusetts in 1985 (then known as Keithy E. The Guru) and DJ 1,2 B-Down (also known as Mike Dee) with various producers, such as Donald D, J.V. Johnson or DJ Mark the 45 King helping out. In 1987 and 1988, Gang Starr released three 12" vinyl singles on the Wild Pitch label. In 1989, the group split and the only member willing to continue under the name Gang Starr was Guru. He soon got in touch with DJ Premier (then known as Waxmaster C) who sent him a beat tape which Guru liked. He invited DJ Premier to join Gang Starr and in that same year they released their first single "Words I Manifest" along with the album No More Mr. Nice Guy (1989). 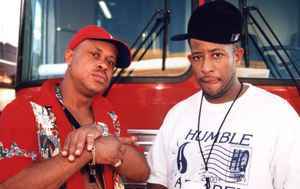 During their career Gang Starr helped pioneer the New York hip hop sound. The entire Gang Starr's catalog, especially Step in the Arena (1991), Daily Operation (1992), Hard to Earn (1994) and Moment of Truth (1998) are well-respected among critics. Their track "Jazz Thing" was featured on the soundtrack to Spike Lee's film Mo' Better Blues. G. Starr, Gang ☆, Gang Star, Gang Starr Productions Inc, Gang Starr Productions Inc., Gang-Starr, Ganga Starr, Gangsrarr, Gangstaar, Gangstar, Gangstar D, Gangstarr, Gangstarr (Guru), Ganstarr, Guru Productions Inc.
R.I.P. Legendary G.U.R.U. Real Jazzman! best rap group ever ! and of course best rap producer Premo ! I feel the same R.I.P one of the great MC'S that ever touched mic has gone but I you all us Hip Hop heads should remember him through his Hip Hop music so definitely remembered not forgotten.One Geebeats. Rest In Peace Guru, you had great positive music, unforgettable voice, you will be missed but never forgotten..